Mariah Carey Shares What She Wants for Christmas on "Fallon"
Carey took a different spin on her self-penned holiday classic, "All I Want For Christmas Is You" by using plastic instruments normally found in an elementary school classroom. Mariah Carey joins Jimmy Fallon & The Roots singing a special rendition of her holiday classic "All I Want For Christmas Is You." Songstress Mariah Carey dropped by the Late Night "Music Room" on Wednesday and shared what she wanted for Christmas. 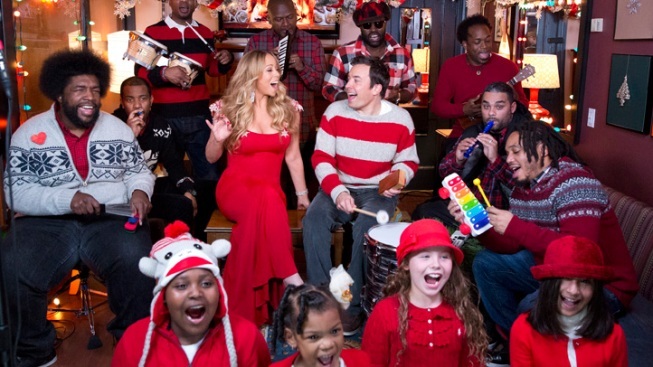 Accompanied by host Jimmy Fallon and The Roots, Carey took a different spin on her self-penned holiday classic, "All I Want For Christmas Is You," with the bunch using plastic instruments normally found in an elementary school classroom. Fallon played the wood block, tambourine, bass drum and kazoo, while Questlove rocked a wooden clacker with an afro pick. Other unorthodox instruments included: a Fisher Price xylophone, recorder, melodica, ukulele, bongos and sleigh bells.